River Lea entrance, can't hide the need for paint with decor! Left: Curt Nestark, GI Historical Society President. Right: Late 1800's crepe & satin mourning dress. Left: 1940's crepe dress. 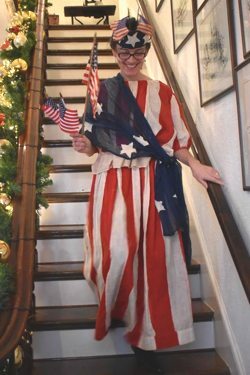 Right: 1915 patriotic costume. Mary Stewart photos above. Left: Early 1900's linen duster/car coat. 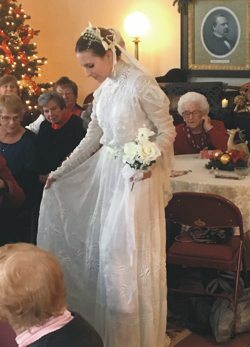 Right Victorian dotted swiss wedding gown. 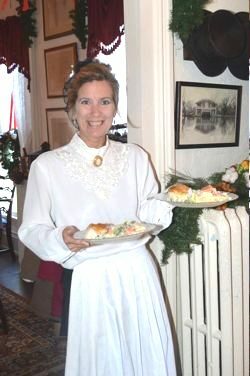 The Grand Island Historical Society had three holiday luncheons December 5, 8 & 9, 2017. This is a very popular event and was sold out all three days. 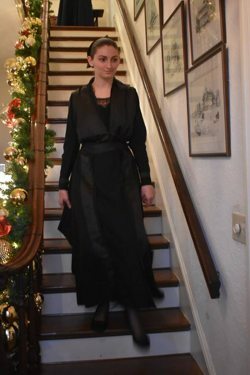 The three course lunch is catered and Historical Society member Maggie Gushue presented "Fashions of the Golden Era", showing some of the fashions from the later 1800's through the 1940's. 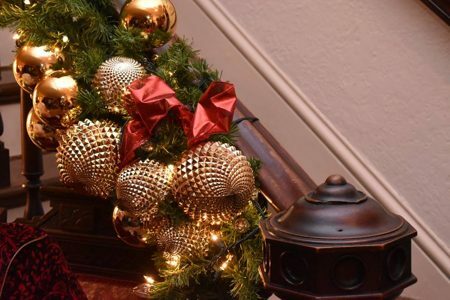 River Lea is beautifully decorated by a team of members that dedicated over 500 hours cleaning, polishing silver, decorating and stocking a "store" with Christmas cookies, holiday decor and handmade canned items. 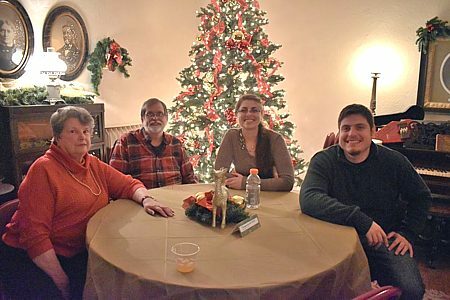 The Grand Island Historical Society held its annual Christmas party on Saturday, December 2nd at its River Lea home in Beaver Island State Park. Hors d'oeuvre to pass and delicious desserts were brought by those who attended. As always the Christmas game, where anyone who wanted to participate brought a small, inexpensive, wrapped gift, is looked forward to. To top off the evening, the "River Lea Bell Players" rang out some Christmas carols. This is always a lot of fun for all as anyone who wishes to has a chance to participate. 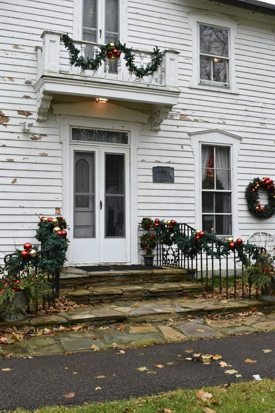 The GI Historical Society Christmas Open House is Sunday, December 10th from 1:00 p.m. - 4:00 p.m.. Come and enjoy the decorations and sounds of the season in our historic farmhouse. 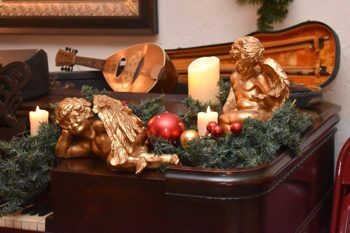 Shop in our boutique and enjoy some refreshments while listening to holiday music by a harpist. 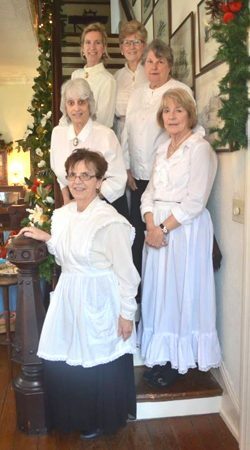 Costumed docents will be on hand to share information about the house. FDR portrayed by Albert McFadyen. 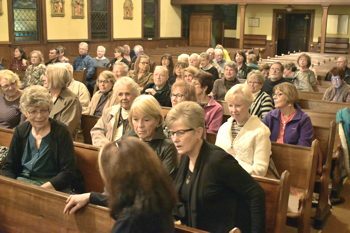 Audience at St. Stephen Old Church. 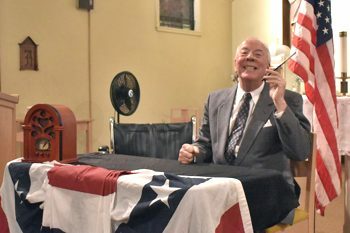 The Historical Society presentation of FDR was held on Thursday, November 2nd at the St Stephen Old Church. Over 100 attendees learned about Pearl Harbor and the war years as FDR impersonator Albert McFadyen told the story. The evening ended with homemade refreshments. Sneak peek at golden decor at River Lea. Update: Friday, December 8th is sold out. There are spaces available on Tuesday, December 5th & Saturday, December 9th. 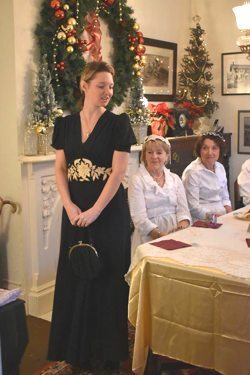 The Grand Island Historical Society's annual holiday luncheon theme is "The Golden Era". Tickets are available for Tuesday, December 5, Friday, December 8 and Saturday, December 9 at noon at River Lea, in Beaver Island State Park. 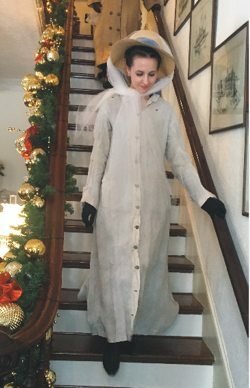 The program will be "Fashions of the Golden Era" by Maggie Gushue. Tickets are $25 and reservations are required. 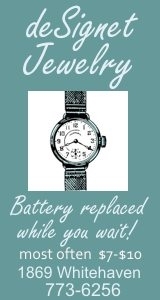 Call Carol Moore at 773-3817. The GI Historical Society invites you to a special presentation..."A Return Visit with Franklin Delano Roosevelt", Thursday, November 2, 2017 at 7:00 p.m. at Historic St. Stephen Church, 2100 Baseline Road. This presentation focuses on the historic days of Pearl Harbor. Step back in time and meet the "President" in person. Albert McFadyen is a local actor, passionate about portraying FDR and has performed in many venues. Everyone is welcome, bring a friend! Admission is free, donations are welcome. Refreshments will be served. The Grand Island Historical Society hosts River Lea Open House on Sunday, October 15th. 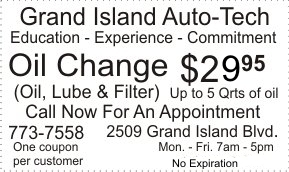 Located in Beaver Island State Park, visit from 2:00 p.m. - 4:00 p.m. The GI Historical Society meeting & program is on Thursday, October 5th at 7:00 p.m. at River Lea, Beaver Island State Park. Our guest speaker will be John Koerner speaking on his book, "The Secret Plot to Kill McKinley: Conspiracy, Curses and Ghosts of WNY". A general meeting and refreshments will follow the program. 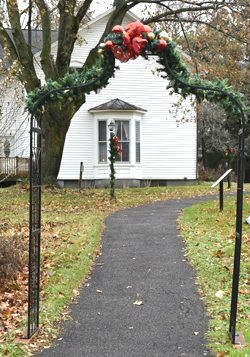 Holiday Luncheon News: The Historical Society Annual Holiday Luncheons will take place Tuesday, Dec. 5, Friday, Dec. 8 and Saturday, Dec. 9 at noon. The program is "Unique Fashions" by Maggie Gushue. Tickets are $25 and available after October 1st from Carole Moore, call 773-3817 for reservations. The Grand Island Historical Society hosts River Lea Open House on Sunday, September 17th. Located in Beaver Island State Park, visit from 2:00 p.m. - 4:00 p.m. The GI Historical Society Potluck Picnic is on Thursday, September 7th at 6:00 p.m. at River Lea, Beaver Island State Park. Please bring your own place setting and a dish to pass. Beverages and desserts will be provided. Save a stamp and bring your membership check to the dinner, too! 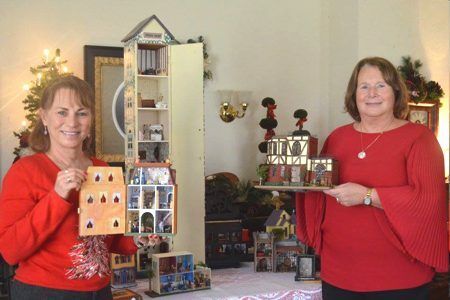 Our program will be a slide show of Grand Island homes, churches and businesses presented by our own Sharon Nichols and Jodi Robinson. The GI Historical Society Installation Dinner will be held on Thursday, June 1st at 6:30 p.m. at River Lea. The GI Historical Society meeting & program is on Thursday, May 4th at 7:00 p.m. at River Lea, Beaver Island State Park. Sandy Starks from Forest Lawn Cemetary will present "Historic Heroines of Western New York".A general meeting and refreshments will follow the program. River Lea Open House is on Sunday, April 23rd. Located in Beaver Island State Park, view the new GI Historical Society dvd "Businesses & Churches in the 1950s", from 2:00 p.m. - 4:00 p.m. 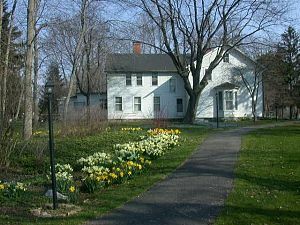 The next meeting of the Grand Island Historical Society will be on Thursday, April 6, 2017 at 7:00 pm at River Lea Farmhouse. Our speaker will be Carol Rogers who is a State Park Naturalist and works for the New York State Office of Parks, Recreation and Historic Preservation. Carol is a member of our society and will present a program on "Lighthouses of the Seaway Trail". A general meeting and refreshments will follow the program. 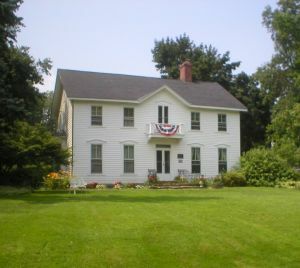 The next meeting of the Grand Island Historical Society will be on Thursday, March 2, 2017 at 7:00 pm at River Lea Farmhouse. 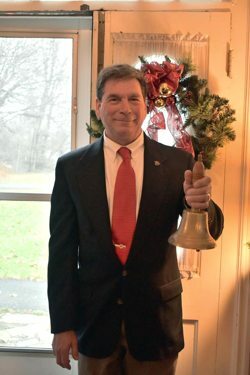 Our speaker will be Ray Wigle with a presentation on the Lockport Locks and Erie Canal. A general meeting and refreshments will follow the program. The first Historical Society meeting and program of 2017 will take place on Thursday, March 2nd at 7:00 p.m. at River Lea in Beaver Island State Park. 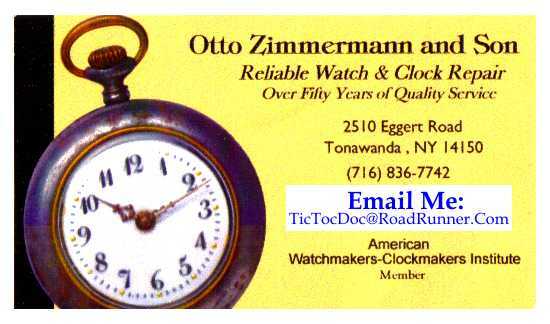 Guest speaker will be Ray Wigle with a presentation on the Lockport Locks and Erie Canal. Everyone is welcome to attend and encouraged to join. 2017 Newsletter. Left: Docent Robin Shipman. Right: Top: Robin Shipman, Adele Upton. Middle: Jeri Benzing, Sharon Nichols. Bottom: Jean Brighten, Carolyn Doebert. Part of the miniature collection. Denise Voelker (left) assisted Nancy LaChiusa with the presentation. 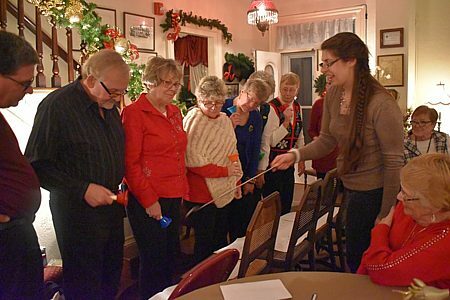 The Grand Island Historical Society hosted their annual holiday luncheonsthis week. 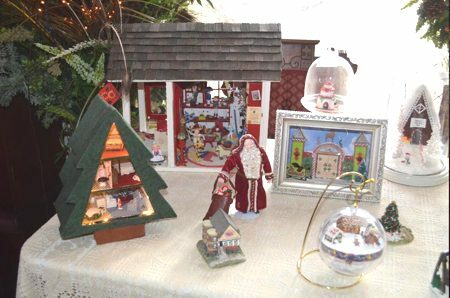 This years program was "Christmas in Miniature" by Nancy LaChiusa. 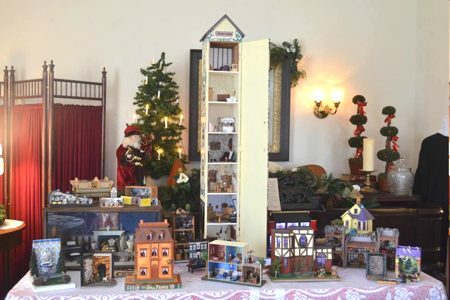 Nancy is a member of a miniature club and had many displays of her miniature collection of houses and scenes that she has created. River Lea was decorated in the Williamsburg style and offered a gift shop that included many holiday decorative items and home made cookies!